How are FX futures different from FX forwards? In the currency markets, one of the most popular products is no doubt the spot forex. It is popular due to the ability of retail traders to trade with an online forex brokerage account. With spot forex, trading is also relatively easy. You simply speculate on the exchange rate and buy or sell the currency pair in order to book profits. However, for the most part, spot forex trading is a speculative tool. There is no delivery of the underlying instrument, which is the currency. Since the currency markets are essential, there are many more participants who have the actual need to exchange one currency to another. For example, a local manufacturer of goods would be paying close attention to the exchange rates especially if they export their goods overseas. Because the exchange rates fluctuate on a day to day basis, it is important for such participants to track the exchange rate in order to maximize their profits. It is not just for profits but also to manage their accounts which becomes crucial when it comes to projecting cashflows and thus the net profit and loss. As a result, using the currency derivatives, companies and individuals are able to better manage and project the future cashflows. This wouldn’t have been the case if the exchange rate for the currencies were stable. Given that the currency markets are very volatile, it becomes imperative for the investor to manage their transactions accordingly. As with most financial markets, the currency markets also have a large set of derivative products. Derivatives in the currency markets and in just about any other markets such as stocks are useful because it enables the investor a lot of flexibility. Let's take a look at what are derivatives in the currency markets. Derivatives, as the name suggests is a product derived from something else. This is nothing but the spot currency markets in the context of forex derivatives. Derivatives allow the investor to hedge their risk or exposure. Derivatives in the currency markets come in different forms. Each of these derivatives has a specific use. Therefore, it would be futile to attempt to guess which of these derivatives are better. The futures and forwards are one of the most widely used currency derivatives. Since manufacturing firms, import and export companies are the major stakeholders, the FX futures and FX forwards are two of the most widely used derivates in this context. Of course, speculators can also use these derivative products to profit from the volatility. An easy way to explain why someone would use the currency derivatives is explained below. For example, if the EURUSD exchange rate was fixed at $1.20, this would make life very easy. By accounting for the number of goods produced and the orders a firm has, they can easily forecast their cashflows for the quarter, or for the year. But the currency markets as you know fluctuate on a daily basis. The rate you see today will certainly be different from a year or a quarter for now. Because a currency can appreciate and depreciate over time, forecasting with such variability can be difficult for firms. Import and export firms therefore make use the derivatives to lock in on an exchange rate for a period of time. This enables them to see the cashflows with a fair amount of stability. This is not the case with the spot forex markets, which is why the currency derivatives come into the picture. FX futures are contracts, that detail at what price a currency can be bought or sold and also sets a specific date at which the transaction can be exercised. The futures market in the context of currencies are highly regulated and traded at a futures exchange. This is to avoid the counterparty default risk. At the end of the contract period, the counterparty holding the contract is legally binding to take delivery of the currency on the date the contract expires and the price that was agreed. To explain this in simple terms, let’s assume that a company A which is manufacturing shoes and exporting them abroad has a big order to fill. The order is due for payment in 90 days. The company that they export to is based overseas and uses a different currency. Let’s assume that the local currency is EUR and the foreign currency is USD and the current exchange rate is 1.1200 USD for one EUR. The manufacturer is expected to receive 100,000.00 US dollars for this order. But they will have to then convert it into the local currency, which is the euro. If the delivery was done today and the transaction closed, the manufacturer would get $100,000 which when converted to euro at the prevailing spot rate of $1.1200 gives them Eur 89,285.72. As you can see from the above example, if the EURUSD exchange rate rises, the manufacturer can get more euros. But at the same time if the exchange rate falls, the manufacturer will get less amount of euros. So, the question is how can the manufacturer hedge this exchange rate risk? In 90-days, there is a good chance that the EURUSD’s exchange rate will either appreciate or depreciate. In order for the company to project their cashflows which will allow them to take decisions such as hiring, payroll, expansion, maintenance of the business and so on, an FX futures contract can be used by the firm. Because all fx futures are priced in US dollars, the firm can sell the $100,000 they get and convert it to the euro at the agreed price. At the end of the 90-day period, the firm will receive $100,000 from their overseas client. They will then exchange the USD for the euro to receive Eur 89,285.72, regardless of where the euro futures contract close. How are FX futures traded (specifications)? FX futures, as mentioned previously are traded at a futures exchange. The most popular futures exchange is the CME Group, also known as the Chicago Mercantile Exchange. The CME group’s futures exchange works similarly to a stock exchange such as the NASDAQ or NYSE. All trading is standardized and there is an order book which keeps track of all transactions made. An FX futures contract is available for most of the liquid or free floating currencies. Besides the main currencies, you can also find forex futures contracts for some exotic currencies such as the Brazilian real or the South African rand. All fx futures are priced in U.S. dollars and operate during the usual U.S. business hours. You can also trade the futures during off market hours, but liquidity becomes very thin. 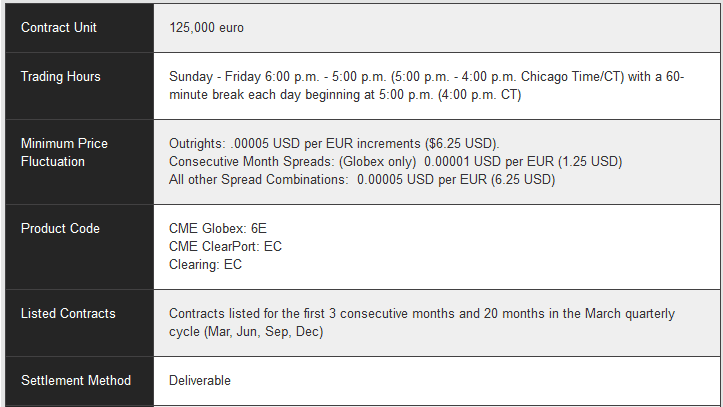 The FX futures contacts comes with a quarterly or a 90-day expiration following which a new contract is opened. The contract size can vary depending on the type of currency futures you are trading. For example, the euro fx contracts come with a standard size of 125,000 units with the tick size incrementing in 0.0005 USD for a euro. The tick size is $6.25. This means that if the price increases by 0.0002, that’s $13.00 worth. The immediate three consecutive monthly contracts can be traded at any time. At the end of the contract expiration, the counterparty holding the contract can settle for the physical delivery of the instrument. This is usually the case with manufacturers or producers. Speculators can simply close out their position before the rollover in order to avoid being obliged to take or deliver the physical settlement. Futures contracts can also be cash settled, meaning that the different is settled in USD. Futures trading of course can be done on margin, thus speculating the forex futures markets can be a bit risky. An FX forward or a currency forward is an agreement between two counterparties. In an FX forward, one of the counterparties agrees to buy or sell a certain amount of the foreign currency at an agreed price for a predetermined time in the future. Within the fx forwards, there are two types. A closed fx forward settles on an exact date, whereas an open fx forward settles within a specified period of time. In an open fx forward, counterparties can agree to settle all the notionals or in parts during the settlement window. What type of an fx forward you choose, depends on both the counterparties agreeing to the terms of the deal. An fx forward is used to hedge the currency risk. It allows counterparties to lock in on an exchange rate on the date. By using fx forwards, counterparties can protect the cost of products or services imported or exported. Exchange rates can also be locked in in advance. The calculation of a forward fx is drawn upon from the prevailing exchange rate in the spot markets. The interest rate parity is also taken into account for both the currencies. The interest rate parity is nothing but the difference in the interest that can be earned between the two currencies in question. FX forwards are conducted over the counter. Therefore, these contracts adhere to the International Swaps and Derivatives Association or ISDA. The ISDA helps to bring structure to the OTC products in case of a discrepancy between the counterparties involved. How are FX forwards traded (specifications)? Unlike the forex futures contracts, the FX forwards are traded over the counter. The most ideal place where you can trade an fx forward contract is your bank. In this case, you and your bank agree to the details and terms of the contract and sign an ISDA agreement. The ISDA agreement allows you to fall back upon in case of any discrepancy. It is also relatively cheaper to trade the fx forwards due to the OTC nature of the trade, compared to FX futures. There will be a small fee to pay when you engage in a fx forward contract. This fee can vary based on a number of factors such as how well the bank knows you and your risk profile. While it is possible for individuals to also open an fx forward contract, it is mostly small and medium businesses to large firms that engage in such transactions. It is important to note that the FX forwards are not the ideal derivative product to use for speculation purposes. Within the FX forwards, there is another sub type of forwards known as non-deliverable forwards or NDF’s. A non-deliverable forward allows you to trade some exotic currencies that are not very liquid. NDF’s are popular among the Asian currencies and in Latin America. Some of the most widely used currencies in non-deliverable forwards include the Indian Rupee, the Indonesian Rupiah, Brazilian Real, Chilean Peso to name a few. As the name suggests, with an NDF, you are hedging the exchange rate risk of the foreign currency. Vanilla NDF’s are always priced in USD. An example of this is the USDBRL currency pair for example. You can also trade exotic NDF or a cross currency NDF. A cross currency NDF is one which does not include the USD. Example is the EURBRL or the SEKBRL. With a cross currency NDF, the rates are calculated relative to the USD. Which means that the exchange will be converted based on the EURUSD rate and the USSBRL rate. With a non-deliverable forward, you will also get the settlement in USD only. This basically allows you to hedge the exchange rate of the foreign currency which is then converted to the USD rate. Having understood how a futures contract and a forward contract works, let’s look at the main differences between these two types of fx derivatives. FX futures are standardized and exchange traded products. This means that regardless of any futures exchange you go, you will get the same contract specifications. This standardization makes it easy to use the FX futures contracts. FX forwards non-standardized and are traded over the counter. The type of contract can depend from one bank to another. The fees are also not uniform as they depend on a number of factors. 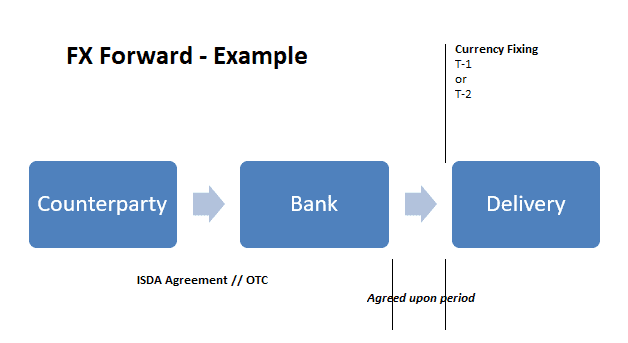 Therefore, a FX forward at Bank A can be different from an FX forward at Bank B. Since FX futures are cleared at a futures exchange, there is no counterparty default risk. This is because, as part of the contract standardization, you are required to post collateral. On a daily basis, the futures contracts are marked to market. This means that you need to have enough money in your account at all times to match the market value at close of business. Because an FX forward is traded as an over the counter product, there is a risk of a counterparty default. Of course, since you mainly trade with a bank, the counterparty default risk is much less. But conversely, when the bank engages in a forward contract with you, the bank faces a counterparty default risk. This explains why the fees for fx forwards can be different and depending on how worthy a bank thinks you are. FX futures can be used to speculate on the currency markets as well. A trader or a speculator can simply engage in a futures contracts such as they would deal with the spot fx markets trading. However, instead of keeping the contract open for delivery, the speculator can simply close out their position before it rolls over and get cash settlement. An FX forward cannot be used for speculative purposes. Although there is a way to do this, it is highly unlikely. Therefore, with fx forwards, you can only see businesses using this type of derivative contracts. Some large investors also use the fx forwards mostly as a hedging tool where there is actual settlement of the underlying instrument or currency pair. Fx futures contracts are settled on a quarterly basis. This means that at the end of the 90-day period, market participants can choose whether they want to roll over to the next contract period, thus extending their positions by another 90-days or simply settle by taking delivery of their existing contract. With Fx forwards, there is no rollover. The FX forward contracts can be set for any period of time. In some cases, you can find that the contracts can even last for just 7 working days. With FX forwards, there is no risk of having to roll over your contract every 90-days. The fx futures markets are very liquid. This means that you can walk away from your obligation by simply selling your contract. It is important to note that in the futures markets, the contracts can be transferable. Therefore, you can choose to buy a contract and then sell it a few days later without incurring any additional costs, except that of the exchange rate. FX forward contracts are not very liquid. Because transactions are done over the counter, there is no way to really see the total volume. Furthermore, since an fx forward contract is legally binding between two counterparties, you cannot walk away from the obligations without having to incur extra charges. FX futures offer only a limited about of currency contracts that you can trade. For the most part, you can trade the highly liquid currencies from the developed economies and some currencies from the emerging markets. While you can find a few fx futures contracts that include some exotic currencies, low liquidity keeps these futures contracts not as popular. With FX forwards, the counterparty is basically free to choose any forward that they want to trade. Due to the OTC nature of the forwards market, the counterparties can agree to a customized forward contract that suits the firm that engages in a forward contract in the first place. This allows forwards to be more customizable and available for just about any exotic currency. Regardless of what currency derivative one uses, there are some risks worth considering. 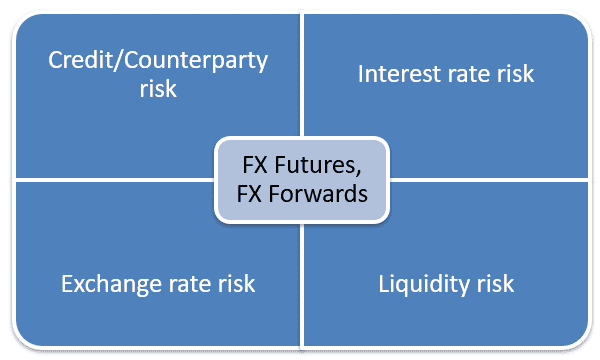 There are three main types of risks when dealing with fx futures or forwards. Credit risk - Credit risk is one of the biggest factors that affects all financial instruments, not just the currency markets. A credit risk is defined as when one of the counterparties fail to fulfill its obligation. Credit risk is more prevalent with forex forwards. In the next few sections you will learn how the credit risk is mitigated with forex futures. Credit risk is also known as counterparty risk. Exchange rate risk - Potentially unfavorable movements in the currency markets can be a risk. This comes due to the fact that counterparties agree to lock in on an exchange rate when the contract is opened. Unfavorable movements in the currency can potentially become a risk for one counterparty while the other could be seen making a huge profit as a result. Interest rate risk - The interest rate risk is also important as it depends on the interest that can be earned with the two currencies. When a contract has been agreed and signed, one of the counterparties will potentially forego the option to get a favorable interest rate. Liquidity risk – Although the fx futures are more immune to the liquidity risk, there is still a risk that counterparties would not want to buy the contracts from you. The liquidity risk is more prone in the forward contracts because of the OTC nature of a transaction. Because you engage in a forward contract with a counterparty, you can only sell back your forward contract if the counterparty agrees. Why use FX futures and forwards? Currency derivatives such as FX futures and FX forwards were developed as a way to hedge the currency exchange rate risk. However, at least for the most part, fx futures are widely accessible to everyone. This means that as far futures are concerned, both firms with genuine need for hedging as well as speculators who merely want to profit from the currency rate fluctuations can use this product. While futures are one way to hedge currency exposure, fx forwards are also another type of derivatives. However, due to the fact that fx forwards are over the counter and involves mostly banks and firms, the average speculator does not have easy access to the forwards market. This makes fx forwards a better choice for firms. However, this does not mean that forwards are exempt from the volatility. However, forwards are better suited for large firms that engage in cross currency transactions. At the end of the day, it is the fees and other factors such as accessibility to the currency in question that will determine which of these two fx derivatives to use.